>> Stephen: WELCOME BACK, EVERYBODY. RICO'S RECOVERY OVER THE LAST TWO MONTHS. PLEASE WELCOME THE MAYOR OF SAN JUAN, CARMEN YULIN CRUZ. >> Stephen: THANK YOU VERY MUCH. >> Stephen: THANKS SO MUCH FOR BEING ON. >> NO, THANK YOU FOR HAVING ME. AND THANK YOU TO THE BAND. >> Jon: THANK YOU, THANK YOU. SO IT'S BEEN TWO MONTHS. HOW IS THE RECOVERY GOING RIGHT NOW? >> WELL, IT'S NOT GOING AS FAST AS IT SHOULD. WE STILL HAVE ABOUT 60% GENERATION. AND THEN IT JUST GETS SENT AROUND THROUGH MOUNTAINS. >> Stephen: SO WHAT PERCENTAGE DOESN'T HAVE POWER RIGHT NOW? AND THE ONES THAT DO HAVE, IT'S VERY UNSTABLE. ON THE ENTIRE ISLAND, WHICH IS 100 MILES LONG BY 30 MILES WIDE. SUDDEN, YOU END UP WITH A LIGHT AND YOUR CELL AS A PHONE. HAVE THE WATER PUMPED UP. YOU DON'T HAVE ANY ELECTRICITY. SO IT'S-- IT'S A TOUCH-AND-GO SITUATION STILL. FROM PUERTO RICO INTO THE UNITED STATES. COME FROM PUERTO RICO INTO THE UNITED STATES. >> Stephen: BUT PUERTO RICO IS THE UNITED STATES. >> WELL, YOU KNOW, WE ARE A TERRITORY OF THE UNITED STATES. >> Stephen: BUT YOU'RE CITIZENS? >> YES, SIR, SINCE 1917. THIS IS A SHOT OF YOU IN THE FLOODWATERS. >> THAT WAS WATER WITH HUMAN EXCREMENT. DOWN IN-- IS THIS IN SAN JUAN. >> IN SAN JUAN, A PLACE CALLED OCEAN PARK. IN SAN JUAN IN PUERTO RICO WERE DYING AND YOU NEEDED MORE HELP. BEEN TOLD BY THE DEMOCRATS THAT YOU MUST BE NEWSCAST TOW TRUMP." AND HERE IS-- THIS WAS YOUR-- >> THAT WAS MY REPLY. >> Stephen: THIS WAS YOUR REPLY. SOMETHING FOR YOU, IF I MAY. JUST A LITTLE REPLY WITH A TWIST. THIS IS JUST FOR YOU. >> Stephen: OH, THAT'S NICE. >> Stephen: THANK YOU FOR WHAT YOU'RE DOING. YOU CAN SEND THERE IF YOU WANT. I GOT $20 BILLS FROM PEOPLE IN TEXAS. WITH THE AMERICAN PRESIDENT THAT HAS SUCH A BIG MOUTH. WELL, FIRST OF ALL, YOU CAN KEEP US IN YOUR THOUGHTS. SECONDLY, YOU CAN DONATE TO THE AMERICAN FEDERATION OF TEACHERS. FAMILY IN PUERTO RICO SO THEY CAN HAVE CLEAN WATER. HELPING SAN JUAN, 42 COMMUNITIES. A LONG ROAD AHEAD OF US, BUT-- CAN YOU SAY "DAMN IT" ON TV? >> SO, DAMN IT, WE'RE GOING TO MAKE IT. >> Stephen: THANK YOU SO MUCH. 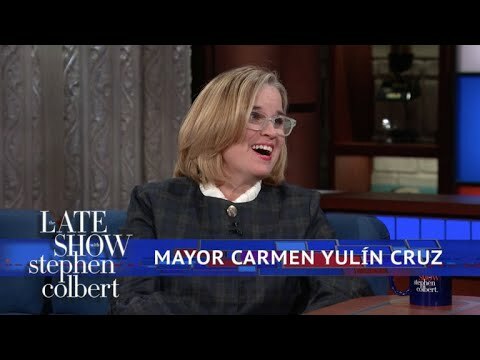 >> Stephen: MAYOR CARMEN YULIN CRUZ, EVERYONE!